A good floor plan, in a smaller space, cleverly balances functionality and beauty. 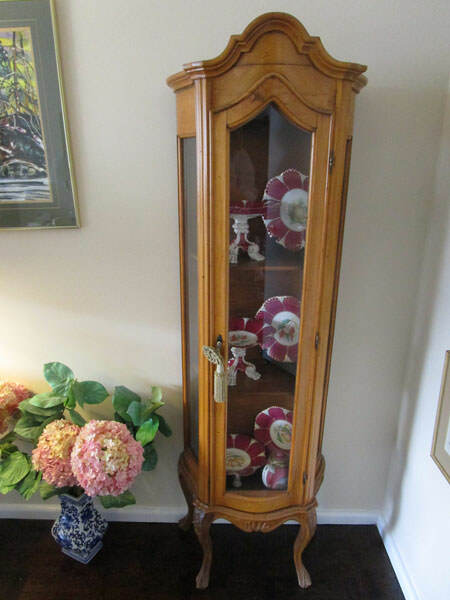 This china cabinet holds its own wonderfully well, and without taking up a lot of space: it hearkens back to the days of dinner parties at home, in this case prepared by a doting husband! The contents are as precious as the memories of those dinners, and the piece helps frame a perfectly lovely living room. The dining room table was sold at auction, but the atmosphere of the dining room was preserved through this piece. In the chronicles of downsizing this is definitely a "Win." Stay tuned for more "Wins!"